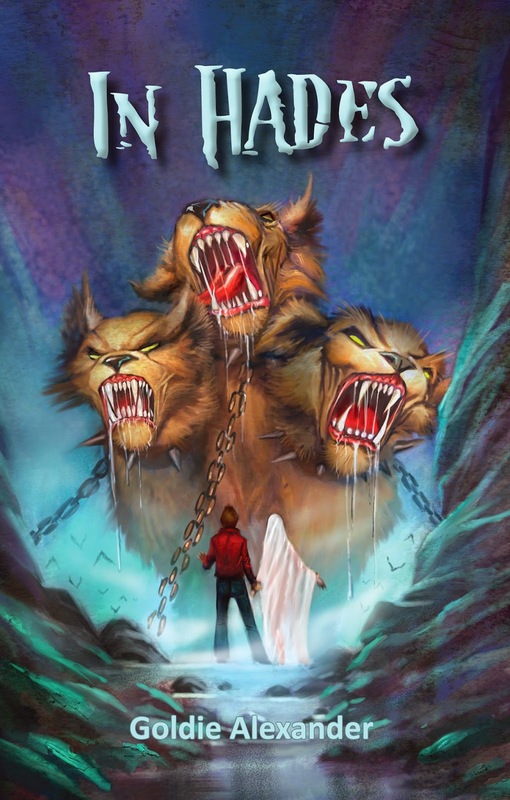 Kids' Book Review is delighted to welcome author Goldie Alexander to discuss the challenges she faced trying something new in writing her verse novel In Hades. We live in an age where more people are being published but fewer have time to read. It’s not helped by increasing length. Woody Allen once insisted all his films last only ninety minutes. If one could only say that about books. As a firm believe in ‘the pinch test’, recently I became interested in verse novels. I was fascinated by the idea that a novel of some sixty to eighty thousand words could be condensed into less than a third, sometimes even less. It seemed to fit very well into our fast paced lives. I mentioned this idea to several writer friends. The unanimous opinion was that this was entirely stupid and not to even think of it. But I have a perverse personality. As soon as I am told I shouldn’t do something, inevitably I go ahead and do just that. At this point I had no idea of how to start a verse novel so I read a lot. Then I immediately ran into trouble. Should the metre be on Iambic Pentameter? Trochee? Spondee? Dactyl? Even Pyrrhic? Should every second line rhyme? How much repetition and symbolism is warranted without overpowering the reader? How will one idea run on from the next? If much poetry in the past was organised into acceptable lyrics and sonnets, few contemporary verse novels seemed to follow any set rule. And as this was to be a novel, should the verses be divided into chapters? If so, how many and how long? My initial idea was to find a way to write about life after death. Buddhists believe in an afterlife. So do Catholics. I’m not sure about Protestants and agnostics. Atheists definitely don’t. But I didn’t want my verse novel to end up as a religious/philosophical argument. Rather I wanted to tackle this idea as fantasy for young adults. My other challenge was political. Recently, one of my latest books was rejected by a friend as unsuitable for her grandchild because the heroine came from a separated family. But unless children have no access to TV, newspapers, internet, and friends, certain facts about modern life will inevitably emerge. Literature can offer a useful way of thinking about today’s issues, a way to comment on our apparent lack of empathy for the less privileged. I believe books should explore basic questions of fairness. Because I live in an inner city suburb that includes both ends of the financial spectrum, I often come across street kids. These young lives are often cut brutally short because of drugs and alcohol. What a contrast to the wealthy young girls also close by suffering anorexia and bulimia in the belief that their appearance doesn’t measure up. Successful novels depend on creating convincing characters and settings and placing unexpected elements together. I had already published a novel aimed at middle graders called Neptunia using some of the magical/fairytale elements to be found in Homer’s Odyssey. At one point Ulysses in his travels, though beloved by the goddess Athena, has incurred the wrath of Poseidon, and he must visit the Underworld or ‘Hades’ to find out how to get back to his long suffering wife. Using this concept in my verse novel I created two youngsters – street kid Kai and anorexic Bilby G. Both have died leaving major issues unresolved. Like Ulysses, both need to find a spiritual home. So my couple meet in the underworld and the story continues on from there. I showed my first draft to a friend who said, ‘This isn’t poetry.’ Then to a poet who told me to make the writing more immediate. Rather than divide the narrative into chapters, I created 47 ongoing poems each clearly labelled. Because we live in a visual age, I decided to format each poem so it would follow the story line and make each look different from what preceded and followed it. For example, when Kai descends into Hades searching for his lost brother, the lines twist as they run down the page. Bilby’s thoughts use different lettering from Kai’s. When Kai and Bilby G talk, these poems appear as libretto. I had originally ignored punctuation apart from dialogue. But when I showed it to yet another friend, she found it too hard to read. Punctuation went back in. This short novel (only fifteen thousand words) took me longer to write than any of my previous prose novels. Rather than fleshing out its contents, every poem needed to be condensed. If an idea or an incident took ten words of prose, in verse it had to be cut down to five. I shortly lost count of the number of drafts and redrafts I did before deciding maybe this was as far as I could go. But finding a publisher! A few didn’t bother to respond. One said, ‘Verse novels don’t sell’. Another, ‘We love it but we don’t know how to handle it.’ Then Celapene Press, who already had success with Di Bates' Nobody’s Boy, was brave enough to take it on. The illustrator Adam Pocock created a wonderful cover and internal drawings. Because of high demands on design, there were an enormous number of redrafts. Because I felt very insecure about this short book, far more than what I usually feel about my books (which I might add is also pretty insecure) I asked various friends to read it, assuring them that ‘it won’t take long.’ Everyone I spoke to was too busy. Only my publisher and my husband kept assuring me the work was okay. But now I worry that it will get lost in the mass of books presently emerging. So I guess that what happens now sits very much in the lap of those gods who presently dwell in Hades. Goldie Alexander is an Australian author of fiction and non-fiction for readers of all ages. Her works for children and teens include That Stranger Next Door, The Youngest Cameleer, and the My Australian Story title Surviving Sydney Cove, In Hades was published by Celepene Press in 2014. You can find out more about Goldie and her books by visiting her website or Facebook page.